Huge numbers of birds are killed by striking windows each year. Reflected foliage or sky fools the birds into thinking it is safe to fly into. Temporarily fit Anti Roost "Bird Spike" to deny the bird access to the edge. Rooks, Magpies and Jackdaws are associated with this problem. On alighting on the ledge the birds finds a soft substance when probing with its beak. This probing is how the birds feel the material, the soft nature of putty or rubber encourages the bird to peck more. Jackdaws and Magpies have been known to peck at window sealing rubbers which become habitual and the birds tend to move on from window to window causing substantial damage. Replacing sealant is expensive. An inexpensive solution to this is the Attack Spider. Many people get an early morning call with birds pecking windows. The birds own reflection "challenges" him and elicits territorial defence thus causing aggressive noise on the window. 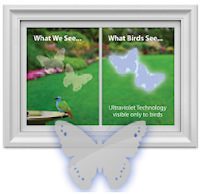 Solution – Attack Spider is a batteryoperated device that will chase away nuisance birds. 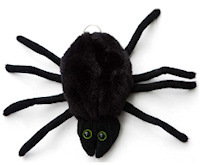 Activated by sound, the spider drops down on an 18 inch string while making a loud noise. Then it climbs back up the string, ready to attack again. This unusual solution is both very inexpensive and highly effective. Cats or dogs can cause a nuisance messing your lawn or flower beds. 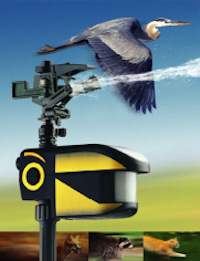 The motion activated "Scarecrow Deterrent" shoots a jet of water at the perpetrator, clearing without hurting the animal. Valuable carp collection can be decimated by Herons and Cormorants. The "Scarecrow Deterrent" will clear these raiders away with minimum fuss. Solution – Scarecrow Deterrent The Scarecrow uses a combination of sudden noise, unexpected movement, and a startling blast of water to create a memorable and unpleasant experience for the trespasser. 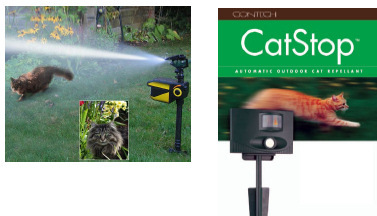 Solution – CatStop The builtin motion sensor detects any cats entering the area and emits a piercing, highdecibel alarm that startles the cat and frightens it away. There are numerous chemical treatment for slugs. However Slugs Away is the ideal solution for chemical free slug control. In essence a 9V battery powers the Slugs Away which repels these invaders in the same fashion as an electric fence. 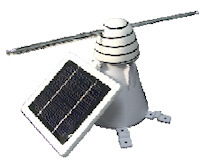 Solution – Solar Bird Repeller / Bird Spider the Bird Repeller is a solar powered bird deterrent that uses continuous motion to prevent large pest birds from landing. Rotating “arms” mounted on top of the unit prevents birds from landing. The two adjustable “arms” cover up to 5ft in diameter by turning continuously at 30 RPM’s. A solar panel powers a heavy duty, brushless motor which will store energy. The Solar Bird Repeller is portable, and can store energy to keep it lasting into the night. The Galaxy Spinner worked by spinning action contains holographic strips that reflect in the wind. The visual deterrent scares birds off. It is contrary to the Wildlife Act in Ireland to interfere with an active nest. Thus if birds are on eggs or feeding chicks, you must let them fledge. By placing a board under the nest, bird dropping can be collected and disposed of from time to time. Once the nest is abandoned you may knock it. We recommend you place one of our realistic Crow Decoy or Magpie Decoy over the location of the old nest. Next year’s Swallows will not nest there, however they may move to another part of the shed. We also have Swallow Nest Shells to encourage nesting in a preferred location. Once the nest is active and eggs are in the nest it is contrary to the Wildlife Act to interfere with the nest. Any actions must be taken before the House Martin arrives for the season. The recommended solution here is to modify the building overhang and fix Bird Slope to it. Each section of Bird Slope is 4' long (1.21m). Its unique design makes it impossible for birds to land on 90degree areas including eaves and ledges. Bird Slope also has a "snap on" extender, which makes it easy to adapt to wider ledges and there are also "end caps" available to prevent birds from getting behind the slope. It is available in two colours, stone and grey to match your installation location. Prevents birds from nesting on open ledges Keep birds off Ibeams Block birds from eave areas Block birds from existing nesting sites Block swallows from nesting under eave areas We also have House Martin Nest Shells to encourage nesting in a preferred location. Prickler strips are mainly used on top of garden walls and fences to protect against cats. Each section is 43cm in length and width is 5cm.